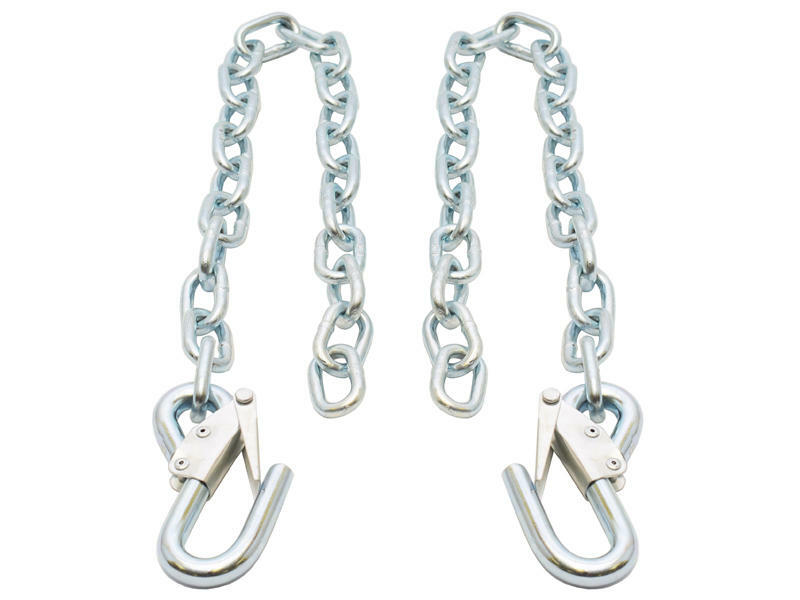 These Safety Chains (sold as a pair) include Spring Loaded Safety Latches for added security. For towing safety, remember to connect safety chains properly every time you tow. Cross chains under the coupler then attach securely to the tow vehicle so they cannot bounce loose. Leave only enough slack to permit full turning. Too much slack may prevent chains from maintaining control if other connections separate. Do not let the chains drag on the road. Laclede Chain Manufacturing Company LLC is an ISO 9001:2000 certified manufacturer of industrial chains and tire traction chains. Hardware & Industrial products include all grades of welded chain including overhead lifting chains, transportation tie down chains, high test chain, proof coil chain and several types of weldless chain. We offer a full line of chain hooks, fittings, and other accessories. Our Tire Chain Division manufactures and imports several classifications of chains for passenger cars, light trucks, SUVs, commercial trucks, buses, tractors and off-road vehicles. With origins dating back to supplying chain links for the Conestoga wagons going West in 1854, Laclede Chain is proud to be a very experienced and trusted chain maker in North America. For over a century and a half, our company has provided the industrial chain market with fine quality products and industry leading customer service. Today we continue to enhance those same principles to serve our customers in ways that help them grow their businesses.